This log book is actually lesson 5 of our CATS work but because we started the lesson by recapping and making additions to logbook entry 4 I am going to do this as a separate logbook to session 5 so the topics are not confused with each other. We then talked about modernism and its defining factors which were: industrialisation, social changes, new technologies and scientific advances and finally political changes. All factors which are explained in my previous log book on why they were such defining factors. Things I learnt from this lecture: a lot really I was a bit on the confused side when it came to the idea behind modernism I knew about it as you can see the technological advancements behind it but to know in depth what its about and what things were the ignition to most of it is a thing I never took the time to involve myself in. Things like the first skyscraper, the first people captured photograph and the first shopping arcade were just things I didn’t know about or I didn’t realise the significance behind them as they are the starting points of the future as it is now e.g. for camera they are now instant capture most of them digital and how 12x optical zoom on certain models. it was interesting to after this lecture go do some individual research on top of this on industrialisation as the lecture made me realise how little I knew on the topic the websites I visited are at the bottom linked in related content. My analysis task did relate in a way as it was relevant to the political changes as when I discussed the topic of children’s intake of the violence in the video games its a topic that has been politically discussed for many years now whether it affects them mentally or not to be violent. Mass communication has become a vital and seamless part of everyday human life. Today’s society is dependent on mass communication, from morning television news to social media feeds and blog posts; from personalized advertising messages to branded content sponsored by a specific company. Messages sent by mass communicators help inform the public and often help set agendas and public opinion. Mass communicators help people develop an understanding of social problems and make informed decisions. The general public is dependent on mass communication for information about goods and services available for purchase or use. 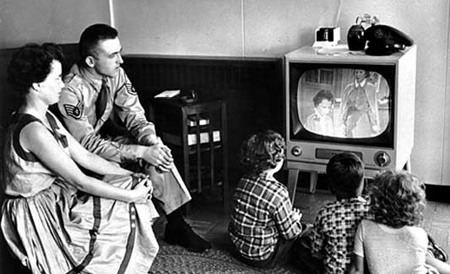 We then moved on to ‘the television and its effect’. this quote sums up modernism as the progress to be better and create new things made technicians and scientists research into this particular area to bring us the television which then was a series of slits and rotating wheels to make an image appear in 1925 as a receiver and now is Ultra High definition 3D border lining what looks like you are just looking through your house window and its all happening outside. • Altering all preceding media of news and entertainment. • Altering our institutions and forms of social relationships. • Altering our basic perception of reality and our relationships with each other. • Altering the scale and form of our society (mobility). • Change to central processes of family, culture and society. • Creates centralised opinions and behaviours. • Promotes domestic consumer economy. • Effect on viewer- greater passivity. • Produces a new kind of large-scale and complex but ‘atomised’ society. We then moved onto a book called ‘Theorising Mass Communication: Marshall McLuhan, The Medium is the Massage, 1968’ which sums up Raymond Williams words in much more detail on the effects of mass communication and the modernism process with the effects and alterations it brings to our lives. Society is shaped more by the media it uses to communicate than the content of its communications was a mini extract from the book. It turns out the title containing the word Massage was a typo as it was supposed to be Message but Marshall wanted to keep it to emphasise the effect that the media has on us. We rounded up the lecture with a man called Sigmund Freud. Freud was an Austrian psychiatrist who revolutionised psychology and invented the therapy of psychoanalysis. Psychoanalysis is a theory of the human mind, a therapy for mental distress, an instrument of research and a profession. A complex intellectual, medical and sociological phenomenon’ his theories can be linked with modernism. Categories: CATS, Log Book | Tags: CATS, log book, Modernism, research | Permalink.